Putting the right kind of strain on a patch of graphene can make super-strong pseudo-magnetic fields, a new study says. The finding sheds new light on the properties of electromagnetism, not to mention the odd properties of graphene. When graphene is stretched to form "nanobubbles," the stress causes electrons to behave as if they were subject to huge magnetic fields, the size of which have never been seen in a lab before. The study is published today in the journal Science. Michael Crommie, a senior scientist in the Materials Sciences Division at Berkeley Lab and a physics professor at the University of California-Berkeley, says this is a completely new effect that has no counterpart in any other condensed matter system. Since scientists began studying magnetic fields more than 100 years ago, no one has been able to sustain big magnetic fields for very long. The record is 85 tesla — a measurement of electromagnetism named for Nikola Tesla — and it only lasted a few thousandths of a second. Make it stronger than that, and the magnets blow themselves apart. But in Crommie's study, electrons inside carbon atoms behaved as if they were subjected to 300 tesla. It has to do with the way graphene is constructed, which leaves one out of every four valence electrons free to hop around. The other three electrons form tight hexagonal chains. When graphene sheets are strained — for instance, when they're rolled up into carbon nanotubes or stretched into nanobubbles — the bond lengths between atoms change, and electrons hop differently. The effect is so strong that it works at room temperature. Berkeley Lab's news site has a more detailed description here. 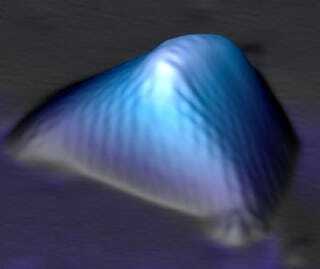 The finding could lead to better electronic and magnetic devices, Crommie says. Controlling where electrons exist and how they move is an essential feature of all electronic devices, he notes. "New types of control allow us to create new devices, and so our demonstration of strain engineering in graphene provides an entirely new way for mechanically controlling electronic structure in graphene," he says.